We are all exposed to millions of man-made chemicals on a daily basis. It is in fact almost impossible to escape exposure – our water is contaminated, the air we breathe is far from clean, the food we eat (if not organic) is laden with toxins, and the products we use for personal and household cleaning contain synthetic chemicals too. We can, however, reduce our exposure by becoming knowledgeable and making educated, informed decisions. For example, use a water filtration system to purify your water; eat fresh, organic produce wherever possible; try to choose a home in a suburb that is far from industry or main roads; wisen up about harmful chemicals in toiletries and household cleaners and choose more natural alternatives, or even better, make your own! Many parents are simply not aware of the fact that the so-called “mild” or “hypoallergenic” products for “delicate” or “sensitive skins” are far from being the pure products they believe them to be! Ever wondered why so many children suffer from skin conditions, allergies and asthma? Most people put it down to being “just one of those things” – it seems that ailments and diseases have become so commonplace that we don’t question why we’re suffering – rather we just accept our problem and battle on. So what are the problematic ingredients that parents should be on the lookout for? And in what ways are these substances harmful? Topping the list is sodium lauryl sulfate (SLS) or sodium laureth sulfate (SLES), with the latter being the higher foaming variation of SLS. SLS is used as a garage floor cleaner, engine degreaser and car wash soap in the cleaning industry! It is thus corrosive and harmful to the skin. In baby products, SLS & SLES are used to make products foam and lather so beautifully, such as baby washes, cleansers and bubble baths. In essence, it is the core ingredient that makes products soapy. Then you get lather boosters, which stabilise bubbles and make them last longer – these are used in bubble baths – cocamide DEA is an example. The US National Toxicology Program has found that repeated skin application to mouse skin of DEA or it’s fatty acid derivative cocamide DEA, induced liver and kidney cancer. DEA is known to readily interact with nitrite preservatives or contaminants in toiletries and cosmetics to form a potent nitrosamine called NDELA (nitrosodiethanolamine), another cancer causing agent, which like DEA, is also rapidly absorbed through the skin. According to the FDA, products containing detergents and foaming agents, emulsifiers and certain solvents (identifiable by the prefix “PEG” or “-eth-“ may be contaminated with 1,4 dioxane which has been shown to produce cancer of the liver and nasal turbinates in animal tests, as well as systemic cancer in skin painting tests. Professor Samuel S. Epstein, world renowned expert on the causes and prevention of cancer, warns that “products containing DEA or TEA (triethanolamine), PEG compounds, ethoxylated alcohols, or polysorbate 60 or 80 should not be used unless the manufacturer provides label certification that states the product is free of nitrosamines or 1.4 dioxane. Dyes are also readily added to products – watch out for FD&C Blue #1 (a chemical dye which is a known cancer-causing agent. Fragrances are also of particular concern as each synthetic fragrance can contain up to 600 ingredients, with 95% of the chemicals found in fragrance being derived from petroleum (as petroleum chemicals are cheaper than the real thing). And to make matters worse, some 84% of the ingredients in fragrances have never been tested for human toxicity, or tested only minimally! Most worrying is the concern that we really do not know what sort of reactions occur when a number of chemically-laden products are used together. 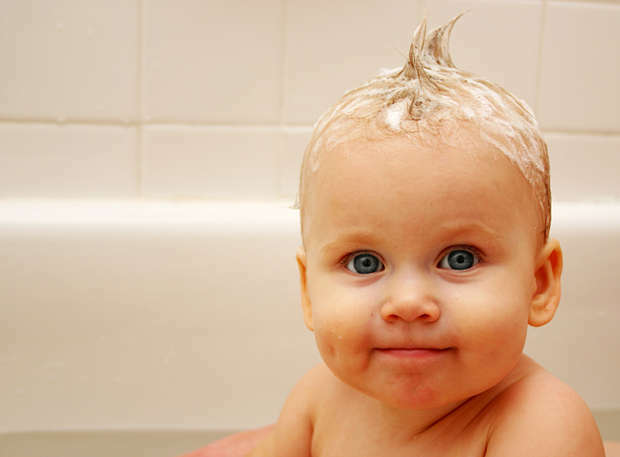 Consider this scenario – you wash and condition your child’s hair, you “treat” them to a bubble bath, wash them with soap, and then if still in nappies, you use talc to ensure that no moisture remains, followed by some barrier cream. Then, if their skin is dry, you smother them with some or other lotion! If you consider that you absorb up to 60% of what you put on your skin, one should be seriously discerning about what you use for you and your family. Note that this write up just touches very briefly on some of the problematic ingredients – there is an incredible amount of information out there, and there is a lot of controversy around what is safe and what isn’t. I think that it’s all about getting back to basics and simplifying your family’s personal care routine. Think back to the good old days…there weren’t the myriad of choices that there are today, and they certainly didn’t use all the concoctions that we fill our cupboards with! This entry was posted in articles and tagged Baby, Baby Products, Chemicals, toxins.